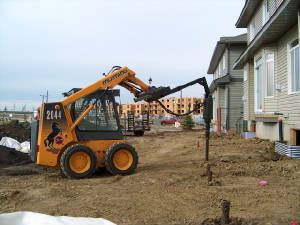 Mustang Helical Piling has been installing screw pile foundations since 2005 in the Edmonton area. Various applications for the residential, commercial and light industrial markets have been our focus. 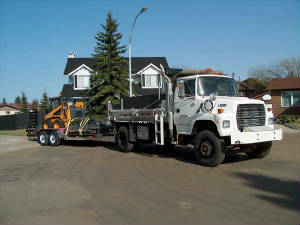 We are WCB members with a SECOR certificate from the Alberta Construction Safety Association. Our engineered product is locally manufactured to meet the Alberta/Canada building code specifications. Mustang Helical Piling installs a variety of pile sizes and pile cap configurations to fulfill the specific applications for it's customers. Screw piles are literally screw in foundations that require no concrete. They comprise of one or more load bearing helixes attached to a round shaft, installed by a very high torque rotary hydraulic motor. Typical shaft sizes range from 73mm to 406mm diameter, although sizes up to 915mm have been used. Helix sizes depend upon the shaft diameter and soil conditions, ranging from 150mm to over 1 meter.